Thanks for all the info Magwart! What do you think about our bowl height then? Do they say in the study what the exact heights were ? Here's the thing about correlations -- there was once a very famous correlation between eating ice cream and kids getting polio (because cases exploded during the summer, most kids diagnosed with polio had recently eaten ice cream). Of course, we now know that polio transmission has nothing to do with ice cream, but there was a panic about not letting kids eat ice cream because it correlated to polio diagnosis. So correlations can eventually blow up and become meaningless as more research is done. Sometimes they connect to causation, but not always! You also have to put all this into perspective: I am not going to have fat dogs with spinal and hip problems, and increased risk of cancer, just to lower the incidence of bloat. A dog with a spinal problem or neck injury may experience less pain in a raised feeder. Feeding wet food (whether moistened kibble or alternative diets) can help keep dogs hydrated. Feeding kibble with rendered meat-meals arguably increases your risk of toxic contamination (it's been a source of recall after recall), so you have to pick what risk you want to embrace, I guess. gsdluvr, Femfa, GandalfTheShepherd and 1 others like this. Last edited by Magwart; 05-04-2018 at 11:18 AM. I don't know if I should toss my bowl holder. I love it. my girl has some dysfunction when eating, her bowl just runs away from her, even with a rubber bottom. I used to sit with it between my feet so she could just eat without chasing it. Then I bought her a bowl holder and it solved all our problems but I never knew it could cause bloat. The boy eats from a bowl on the floor. GandalfTheShepherd and Kittykattyness like this. Do you know of any raw fed dogs that have bloated? I'm sure it can happen, as bloat can happen in any animal from a Mouse to a giraffe. I personally, do not know of any raw fed dogs that have bloated. In my experience it is far less likely to happen to a raw fed dog compared to a dog fed a kibble diet. This is interesting and excellent information. I never feed 2 hours before or after working my dogs strenuously. I also will not feed if my dog is stressed, until it relaxes. Stress can come in many forms to a dog, like a simple vet visit or a strenuous exercise or training set. If feeding kibble, I would feed twice a day. There are many reasons for that, preventing bloat is just one. Dogs work and perform better on two meals a day. Even tracking and detection work is enhanced by feeding dogs twice a day. I would also limit water before an after feeding. Especially, if feeding once a day. The kibble will absorb water and expand in the stomach. Just drop a piece of kibble in a water bowl and see how much it expands. I do believe there is a correlation between fast eaters, water consumption and bloat. This is purely anecdotal, based on my experience with working dogs over the years. I absolutely believe there is a genetic component to bloat and minimizing risks are very important. "Tanking" is a similar condition to condition from gulping up large volumes of water. The stomach can distend from that as well. It is critically important to recognize the early signs of bloat and seek medical treatment immediately. Bloat is a medical emergency and the only thing that will kill a dog faster than bloat is something traumatic like being hit by a car or being shot. I teach a class during every patrol and narcotics school that I run on bloat prevention and recognizing the signs. 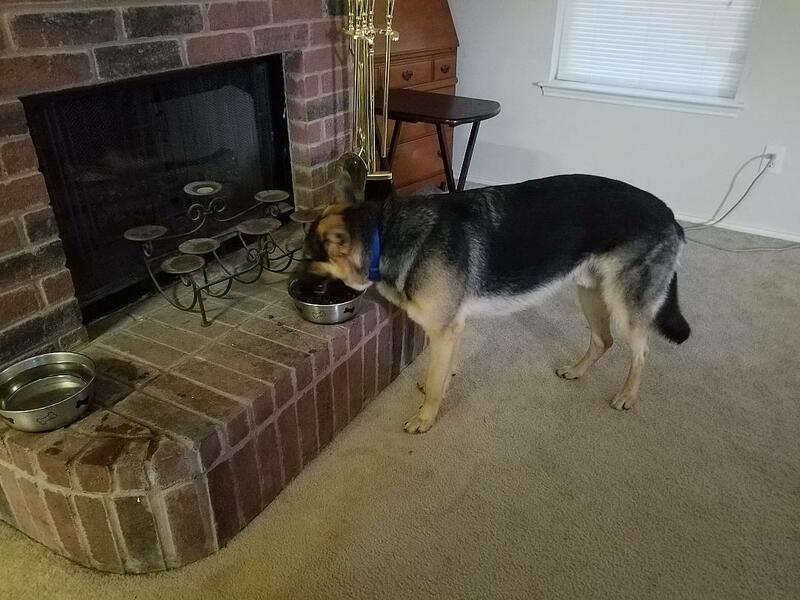 I got a call two weeks ago from a very grateful handler that recognized that his GSD was starting to bloat and immediately rushed him to the vet. The dog is fine and the vet credited his fast response to saving the dog's life. The handler called to thank me specifically for the class and information and said that his dog would be dead if he hadn't been taught what to look for. I'm happy his dog is doing well and I was able to help. gsdluvr and Sunsilver like this. First lesson in statistics: Correlation does not imply causation! Confounding variables can be tricky little buggers. That is REALLY interesting to know that the Tufts study came back with no correlation between exercise on either side of a meal and bloat. I had been told that one newer study suggested that it was actually beneficial to take a moderately paced walk after the dog eats, to keep everything moving. I didn't go look that up for myself (we're currently still doing an hour rest on either side of a meal if for no reason other than that our routines are built that way now).